Back to school will be here sooner than you know it. 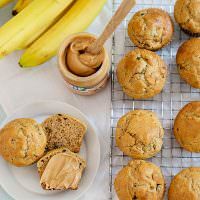 Banana Peanut Butter Muffins and morning hacks to get everyone out the door happy and with less stress. This summer is flying by. It feels like we just got out of school (we sort of did, we didn’t get out until the last week of June) and now everywhere you go there are school supplies and backpacks in the front of all of the stores. I’m not quite in that head space yet, but I’m always thinking about ways to make our days, especially mornings, happier and more efficient. I’ve partnered with Jif® Peanut Butter to bring you some of my best morning hacks to start everyone off on the right foot. Kids and parents. 1. Get some sleep. I can’t stress enough how important sleep is for stress relief, growth, and rejuvenation. Set a bed time and try your hardest to stick to it. Kids need more sleep than you think they do. (Here is the recommended times for kids.) Keep your devices out of the bedroom and get some shut eye. Your morning will be so much nicer if you wake up refreshed and ready to go. 2. Start your morning the night before. I like to go to bed with a clean kitchen, picked up house, and things ready to go for the next day. I am not naturally a morning person, so if I go to bed knowing that things are ready for the new day, then I sleep better knowing that I don’t have to rush as soon as I wake up. 3. Think about breakfast the night before. Having breakfast ready to go or at least knowing what you are going to have is going to help guarantee that you have a protein packed, healthy breakfast. These yogurt fruit parfaits are loaded with fresh fruit (bananas, blueberries, and strawberries), whole milk yogurt, Jif Cinnamon Peanut Butter Spread, and granola for crunch. You can put these together the night before and if you put them in a container, they are a great portable breakfast. 4. Keep a well-stocked pantry. Having options and things on hand will help ensure that you aren’t grabbing an unhealthy breakfast at the doughnut shop or the drive thru. Keep your fridge stocked with fresh fruits and dairy products. Have nuts, seeds, grains, spices, and nut butters available to put together a variety of options in the morning. On weekends I make and freeze extra pancakes and waffles to reheat during the week. Doubling my recipe means that I can have grab and go breakfasts all week long. 5. Take a look at the weekly calendar on Sunday night. Check and see what your family’s week is going to look like. Knowing that you are going to have a jam-packed week is half the battle. There is nothing worse than remembering that you have a recital Wednesday evening at lunchtime on the same day. Keep a family calendar in a central location in your home. Make sure to keep it updated and that everyone adds their things to it. This has made life so much nicer at my house. 7. Set an alarm. I used to hate the alarm, and now I’m often awake before it goes off. But waking up to an alarm is better than jumping out of bed and realizing that you need to be out the door in 15 minutes. I love using a FitBit for my alarm. It’s a gentle way to wake up. I also love to track my sleep. Seriously, I get so much more sleep now that I am aware of how much I am getting. 8. Pack a snack. I can’t tell you how many times I wish that I had food in my bag or car. It’s amazing how quickly my blood sugar starts to plummet and I need something fast to make me human again. Keep healthy snacks strategically placed so that you always have something on hand whether you are home or on the go. When you are prepping vegetables, cut up some extra carrots, peppers, and celery. I like to make a big batch of hummus on the weekend to snack on all week long. Ideas for your bag and car – nuts, granola bars, dried fruit, and granola. 9. Get the kids involved. My kids are in charge of packing their own lunches these days. (Supervised, so they don’t just pack cookies.) They need to be responsible for making the morning positive too. They pack it while we are cleaning up the kitchen after dinner. Kids can do a lot of jobs and take ownership of some household chores. 5 people live in our house, so 5 people are responsible for the maintenance and keeping it running. Delegate some age-appropriate jobs to the kids and see what happens. 10. Enjoy your weekend and recharge. Weekends are made for rest. Often, it is when we try to catch up and do too much. We start a new week tired and stressed out. What can you get off of your plate? I am a big fan of having my groceries and household items delivered. One less trip to the store. (If you haven’t tried it, do yourself a favor and do it. Once you get it set up initially, it is so easy to order. You don’t have to look around the website for things that you already buy.) If I can have it delivered, I do. It frees up your valuable weekend time to so that I can do what I really need to do. Enjoy my family and recharge. The new Jif Flavored Spreads feature Jif Peanut Butter in morning-inspired flavors — maple and cinnamon. You can spread it over a piece of toast, add it on top of a favorite pancake recipe, swirl it into a bowl of oatmeal, eat it right from the jar, or bake it into my Banana Peanut Butter Muffins. Jif Flavored Spreads are a great addition to your favorite breakfast items. An easy muffin to make for busy school mornings. Cool completely and freeze in an airtight container. Reheat and enjoy! Preheat oven to 375°. Line a 12 cup muffin pan with paper liners. Set aside. Whisk together flour, brown sugar, baking powder, and salt in a medium bowl. Set aside. In another small bowl, mash bananas with a potato masher or fork. Add peanut butter spread, oil, eggs, and vanilla. Whisk until blended. Stir the wet ingredients into the dry and mix until just combined. Scoop into the prepared muffin pans. This post was brought to you by Jif Peanut Butter. I received product samples for review purposes. Opinions are 100% my own. I’m not sure what you mean by the term “hack”. I guess my age is showing because I can’t find a definition that seems to suit the post. Is there a new use for hack or is this an acronym? It means a shortcut or tip. hi bree! what kind of containers are you using in the picture of the parfaits? They are weck jars. Do a google search, they come in all sizes and shapes. I am tired of overnight oats so this post is awesome. I will definitely try the muffin and parfait ideas this weekend. These look wonderful.do you think they could be made egg free? Thanks! I think that you certainly could try. I think that the flax/water method would probably work well. Some really good time saving ideas, I don’t think I have ever tried a Peanut Butter Banana Muffin.